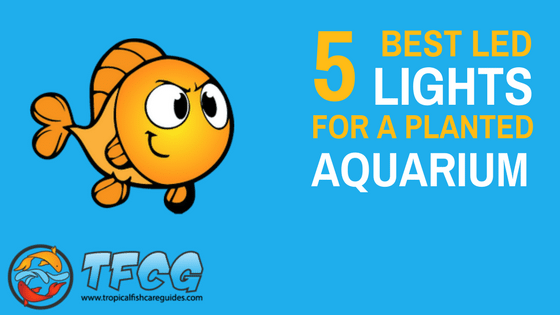 If you want to grow a thriving planted freshwater aquarium, it’s important you get the right LED light fixture for the job. LED fixtures are a great option for a number of reasons: they use less energy (both from the power grid and from you), they save you money in the long run, and many of them offer far more control than non-LED lighting systems. The Marineland Aquatic Plant LED Light with Timer is a fixture that features 6500K white lights and RGB LEDs. This combination of LED colors provides your plants with the spectrums of light they need to thrive. It can also bring out the colors of the plants in your aquarium. This marineland led fixture has slim black housing, with extendable legs. The legs add an extra six to twelve inches to the length of the light, depending on the starting size of the fixture. As the name suggests, this fixture has a timer built in. It has two light settings: daytime and lunar. These settings can be controlled separately with the timer–you can set start and end times for both. When you’re dealing with a plant growing, higher output light, a timer is important. Too much light and you’ll start growing algae (and potentially harming your plants). YouTuber PetSolutions has a video showing their Marineland aqurium light in action on a freshwater aquarium. The video shows some healthy plants, and showcases both daytime and lunar lighting modes. The video closes out with a demonstration on how to set up the built-in timer. 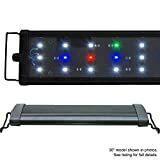 The Beamswork EA Timer FSPEC LED fixture is very inexpensive compared to other LEDs on this list. The Beamswork is slim and has the fairly common black aluminum housing. The fixtures also includes extendable brackets, so you can adjust the fixture length to fit your tank. The Beamswork FSPEC is equipped 10000k white lights, as well as RGB. This fixture isn’t the brightest light on the market. It’s probably best suited for low light plants or shallow tanks. It features two modes: day mode, where all the lights are on, and night mode, which is your standard blue light setting. The colors on this full spectrum light can’t be controlled beyond these two lighting modes. This fixture is pre-wired to work with a timer, but the timer is sold separately. If you’re looking to grow low light plants or you need an inexpensive supplemental light source, this Beamswork fixture is a great option. YouTuber JDO Fishtank has a video showcasing his own Beamswork EA FSPEC LED. The visual comparison starts around the 8:30 minute mark, where he shows his tank’s old lights and then switches to his new Beamswork. Prior to that he spends time comparing some options and talking about why he went with this particular light over other available fixtures (could be helpful if you’re in the same boat!). The Current Usa Satellite Plus Pro LED is a feature-packed fixture with high levels of light customization. As a result, it’s one of the most expensive units available. The Satellite Plus Pro is a thin black fixture intended for use in freshwater aquariums. This fixture has weather effects, like storm and cloud cover. It also features settings for moonlight, sunrise, and more. You can access these lighting modes using the pre-programmed buttons on the remote (which is included). The remote also has “four freshwater optimized preset colors.” If you’re feeling more adventurous, you can create custom colors by using the remote to adjust the levels of RGB and white lights. If you find a color you really like, you can save it to one of two memory slots available on the remote. The Current Satellite Plus Pro LED fixture also features a 24 hour on/off timer cycle. The timer lets you pick the start and end times for your light. It also features the ramp up and dim down features. When your timer kicks on, the first 15 minutes mimics a sunrise as the light gradually increases. In the 15 minutes before your light turns off, the fixture gradually dims. The light intensity is adjustable. You can make adjustments based on how your tank responds to the fixture. YouTuber Pecktec has put together an informative and entertaining unboxing and setup video, so you can hear more about the fixture and actually see the Satellite Plus Pro LED light in action. The Finnex Planted Plus LED is a moderately expensive unit with a few neat features. The fixture is thin, black, and low-profile. Rather than extendable brackets, this light has legs that let you use to tightly secure the fixture to your tank. The legs are adjustable in a few ways: They slide to accommodate smaller tanks, have screws to fit rimless tanks, and have a removable inner portion to fit on slightly larger rimmed tanks. The light comes in 5 sizes. The smallest is a 20” fixture, the largest size is 48”. This fixture earns its 24/7 name with a 24-hour day/night automated cycle. The fixture comes with this timer built-in. With the remote, you have the option of selecting the automated 24/7 feature, or jumping to a specific time of day (9 am, noon, 3 pm, 6 pm, etc). The cycle starts with dawn, brightens into a rising sun, and brightens further into an intense high noon. From there, the cycle eases into a reddish sunset and an eventual starry blue moonlight. The cycle repeats the following day without requiring any button-pushing from you (as long as it’s working properly–some customers have reported issues). The light comes with 7000k and RGB lights. The fixture also has weather effects, like thunderstorm or cloudy day. You can customize your own colors (by adjusting the level of white and RGB lights individually) and save them to one of four memory light slots. YouTuber Cam’sJungleAquaria showcases his Finnex lights in a review video. He walks you through the 24/7 feature, the color options, and more. The Finnex Ray2 Aquarium LED Daylight fixture is a high output, no nonsense kind of light. The fixture is equipped with dual 7000k LED light strips. This unit is moderately expensive compared to other available fixtures. SInce the Ray2 doesn’t have any RGB lights, the light fixture does give off a yellow/golden-tinted color. It’s designed to boost plant growth. As a result, compared to similar lights, this fixture gives off a lot of light. The housing is silver and sleek. The sliding, adjustable legs give you some wiggle room when it comes to fitting the light on your tank. The light comes in five sizes, with 18 inches being the shortest unit and 48 inches being the largest. Each unit is three inches wide and just one inch high, regardless of length. The fixture has a moisture-resistant splash guard, but you’ll still want to avoid getting it too wet. The light doesn’t give off very much heat, the fixture is designed to allow ample cooling. Many customers have reported that their plants love the light. Some wilting high-light plants have perked right up after the Ray2 took charge of tank lighting. YouTuber CreativePetKeeping shows her Ray2 in action on one of her tanks. She has a deep 30 inch tank, and the Ray2 lights it right up. If you’re looking to grow a tank with ample vegetation, the Finnex Ray2 is definitely worth a look.